British Columbia – The Hon. 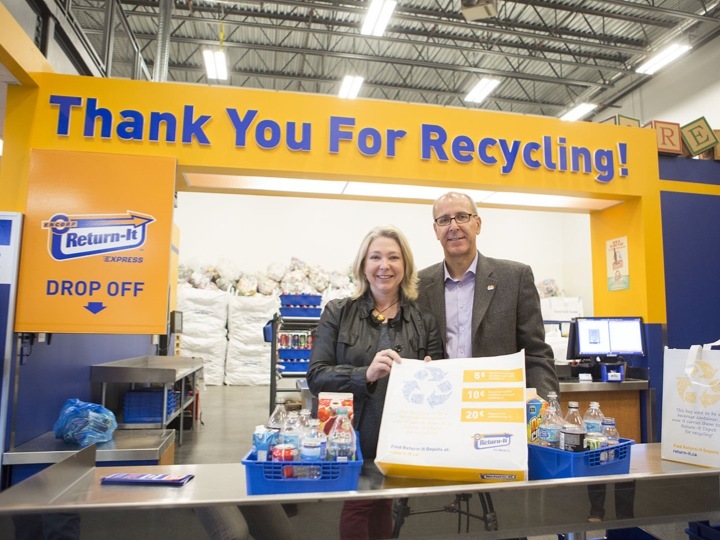 Mary Polak, M.L.A., Minister of Environment was recently on hand at the Queensborough Landing Return-It Depot in New Westminster to recycle British Columbia’s 15 billionth beverage container. This event marked Encorp Pacific’s 20th anniversary as a not-for-profit product stewardship corporation with beverage container management as its core business. British Columbia has one of the highest beverage container recycling rates in North America. Last year alone 80.1 percent of all beverage containers sold in British Columbia were returned and recycled. Almost 1 billion used beverage containers were returned for deposit and processed into new products. That includes 356 million aluminum cans, 340 million plastic bottles, 198 million glass bottles and 69 million drink boxes and cartons. In 2013, Encorp Pacific collected over 90,000 metric tons of recyclable material, an equivalent weight of 60,000 mid-sized cars. Encorp Pacific’s data shows that recycling beverage containers in British Columbia saves enough energy to power 42,000 homes for a year, and reduces 94,700 tonnes of CO2 equivalent from being released into the atmosphere. Encorp Pacific is the environmental stewardship agency that runs the Return-Itprogram. Its extensive network of over 170 independently owned Return-It depots across the province is the heart of the system, collecting 92 percent of all the beverage containers recycled in BC. Encorp ensures that deposits are refunded to consumers when containers registered in the system are returned to Return-It depots, major grocery retailers and liquor stores. Encorp also ensures that after collecting and sorting the empty beverage containers, they are transported to processors and then sold to end markets so they can be recycled into a variety of new products.